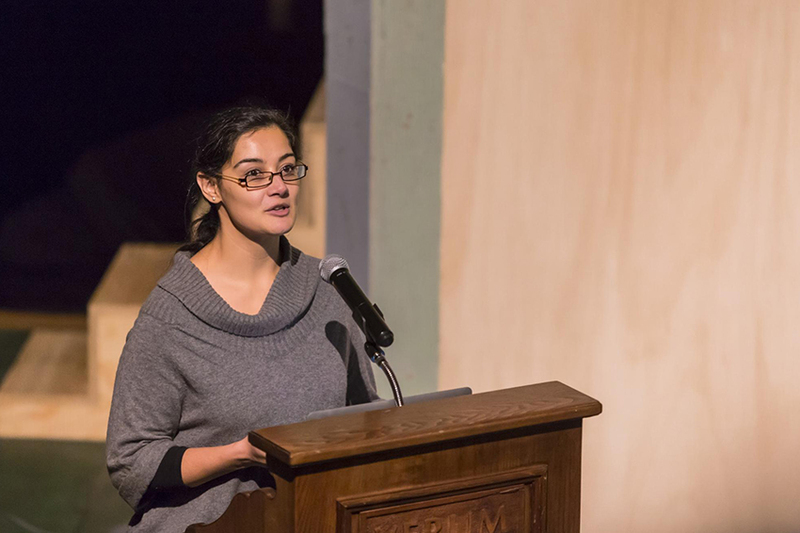 Humanitarian and author Heela Najibullah spoke to TASIS students about her remarkable life in the Palmer Center on the evening of November 7. Born in Kabul, Afghanistan, Najibullah grew up in a political family at a time when the Cold War was intensifying. Her father, Dr. Najibullah, would go on to become the president of Afghanistan in 1987 and initiate a National Reconciliation policy. As political conditions worsened in Afghanistan, Najibullah and her sisters were sent to India in 1992, where she expected to stay for a few months. But when her father soon after agreed to cooperate with the United Nations and resign as president, it became clear that Najibullah could not return. Twenty-four years later, she has still not set foot in her home country. Najibullah arrived in India at the age of 14 and did not speak a word of English. As she enrolled in school, learned both English and Hindi, and came to terms with the idea that she could not return to her homeland, she struggled to understand her identity. Was she a refugee? An asylum seeker? An economic migrant? This internal struggle would go on to define much of her life’s work. Tragedy struck in 1996 when Najibullah’s father and his brother were executed by the Taliban. She subsequently lost her student visa to the UK, where she had hoped to study medicine. She was instead able to secure a visa from Switzerland to study at Franklin University, where she would earn a B.A. in International Relations and Communications prior to completing an M.A. in Peace, Conflict Transformation, and Security Studies from Swisspeace Academy and Innsbruck University. Najibullah has since amassed ten years of experience as a humanitarian worker with the International Federation of Red Cross and Red Crescent Societies in the field of forced migration and disaster management, serving the most vulnerable groups—asylum seekers, refugees, natural disaster victims, internally displaced persons, and victims of human trafficking and smuggling—in Cambodia, Indonesia, Philippines, Nepal, India, and Sri Lanka. In between her missions as a humanitarian worker from 2007–2011, Najibullah initiated and mentored youth-driven civil society projects in South Asia, working mainly with Afghanistan, Pakistan, and India. The projects aimed to raise awareness of the existing common ground between the neighboring countries to build broken bridges and transform conflict amongst the civil society in the region. She has also worked with think tanks to develop policy by organizing track-two meetings between Afghanistan, India, and Pakistan. Najibullah has written many articles on the role of civil society in peace-building and the conflicts in South Asia. Her first book, Reconciliation and Social Healing in Afghanistan, will be published in January 2017. Ms. Najibullah was the second speaker welcomed to campus this year for the Senior Humanities Program, which seeks to draw from five defining elements of the TASIS identity—truth, beauty, goodness, international understanding, and humanitarian action—to provide seniors and postgraduates with a signature educational experience, which includes a series of discussions, trips, lectures, and tours throughout the year. The SHP Committee, which has been chaired by Peter Locke since 2012, selects five speakers each year who embody the pillars of the program. Journalist John Hooper visited on October 24 to kick off the 2016–2017 program. Filmmakers Chris Temple and Zach Ingrasci (January 19), author Steve Hahn (February 20), and Berkeley professor Jeffrey Reimer (March 13–15) will round out this year’s lineup.